Deborah MacLatchy was appointed the next president and vice-chancellor of Wilfrid Laurier University on Jan. 10, 2017. She began her current term July 1, 2017, succeeding Max Blouw, who completed his second five-year term on June 30. MacLatchy joined Laurier in 2007 as dean of the Faculty of Science. In 2009, she was appointed vice-president: academic and provost. She also served as acting vice-president of research from December 2014 to November 2015. MacLatchy began her academic career at the University of Winnipeg and the University of New Brunswick (UNB). She served in a number of senior roles at UNB, including dean of Science, Applied Science and Engineering and director of the International Office. MacLatchy earned an honours BSc in biology from Acadia University, a PhD in zoology from the University of Manitoba, and completed postdoctoral work at the University of Guelph. Since joining Laurier in 2007, MacLatchy has played a lead role in many of the university’s significant initiatives, including: a new strategic academic plan; the establishment of innovative undergraduate and graduate degrees; development of Laurier’s integrated and engaged learning model; development of the multi-campus governance framework; the launch of the Laurier Institute for Water Science; the creation of the Laurier Centre for Women in Science; the advancement of the university’s research agenda; creation and expansion of the Office of Aboriginal Initiatives with a focus on community partnerships and support for Indigenous students; championing an enhanced focus on diversity, equity, gendered violence and inclusivity initiatives; and the implementation of Laurier’s new Responsibility Centre Management budget model. In addition to her role as a senior administrator, MacLatchy is an active researcher and graduate-student supervisor with a focus on ecotoxicology and comparative endocrinology. She has published more than 80 peer-reviewed publications and is funded by the Natural Sciences and Engineering Research Council of Canada (NSERC) as well as through industry and federal, provincial and territorial infrastructure grants. She is a founding fellow and past chair of the science directors of the Canadian Rivers Institute, and is a past-president and council member of the Canadian Society of Zoologists. She is co-lead of the ecotoxicology node of the Southern Ontario Water Consortium and chair of the board of the Balsillie School of International Affairs. MacLatchy has been recognized for her many achievements with a number of significant awards, including an honorary doctorate from Acadia University in 2016 and the 2015 Recognition Award from the Senior Women Academic Administrators of Canada. As well, she was named one of Canada’s Most Powerful Women for 2012 in a Top 100 list compiled by the Women’s Executive Network. 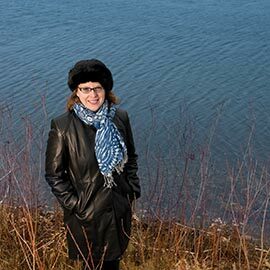 Her research was awarded a 2005 NSERC Synergy Award for Innovation to recognize the successes of her industrial and government partnerships to remediate the environmental effects of pulp-mill effluents. Research in my laboratory focuses on the effects of environmental contaminants on fish reproduction, development and growth. I am primarily interested in the source, mechanisms of action and effects of anthropogenic chemicals known as “endocrine disruptors” on fish native to Canadian ecosystems, especially those ecosystems under additional pressures such as climate change and urbanization. Fish species and ecosystems under study include mummichog (Atlantic estuaries), shiners (rivers of the Northwest Territories) and darters and fathead minnow (southern Ontario rivers). Industry partners include pulp and paper, oil and gas, and municipal wastewater treatment. The lab also partners on a number of community-based projects in the Northwest Territories focused on the effects and mechanisms of action of contaminant exposure (e.g., mercury) and climate change pressures on large-bodied fish such as walleye. Honorary Doctorate from Acadia University (2016). Angela Hilyard Recognition Award — Senior Women Academic Administrators of Canada (2015). Women’s Executive Network, Top 100 Canada’s Most Powerful Women, Public Sector Category (2012). Natural Sciences and Engineering Research Council of Canada Synergy Award, with M. Dubé and M. Hewitt (2005). Potential undergraduate, MSc and PhD students, as well as postdoctoral fellows, are welcome to apply to train in my lab. My lab is full for 2018/19; new undergraduate students will be considered for summer/fall 2018 and new graduate students for spring/fall 2019. Students with strong interests and backgrounds in at least one of physiology, chemistry/toxicology and statistics will best succeed in the lab. Marjan, P., MacLatchy, D. L., Van Der Kraak, G. J., Fuzzen, M. L., Bragg, L. M. and Servos, M. R. 2017. "Assessing recovery of in vitro steroid production in male rainbow darter (Etheostoma caeruleum) in response to municipal wastewater treatment plant infrastructure changes." Submitted to Environ. Toxicol. Chem. Accepted September 2017. Martel, P.H., O’Connor, B.I., Kovacs, T.G., van den Heuvel, M.R., Parrott, J.L., McMaster, M.E., MacLatchy, D.L., Van Der Kraak, G.J. and Hewitt, L.M. 2017. "The relationship between organic loading and effects on fish reproduction for pulp mill effluents across Canada." Environ. Sci. Technol. 51:3499-3507. Marjan, P., Martyniuk, C. J., Fuzzen, M. L., MacLatchy, D. L., McMaster, M. E., and Servos, M. R. 2017. "Returning to normal? Assessing transcriptome recovery over time in male rainbow darter (Etheostoma caeruleum) liver in response to wastewater-treatment plant upgrades." Environ. Toxicol. Chem. 36:2108–2122. Orrego, R., Milestone, C., Hewitt, M., Guchardi, J., Heid-Furley, T., Slade, A., MacLatchy, D. and Holdway, D. 2016. "Evaluating the potential of effluent extracts from pulp and paper mills in Canada, Brazil, and New Zealand to affect fish reproduction: Estrogenic effects in fish." Environ. Toxicol. Chem. 36:1547–1555. Rutherford, R., Lister, A. and MacLatchy, D. 2015. "Effects of the model androgens methyltestosterone and dihydrotestosterone on reproductive endocrine status in mummichog (Fundulus heteroclitus)." Comp. Biochem. Physiol. C 170:8-18. Blewett, T.A., Chow, T.L., MacLatchy, D.L. and Wood, C.M. 2014. “A species comparison of 17α-ethynylestradiol uptake and tissue-specific distribution in six teleost fish”. Comp. Biochem. Physiol. C 161:33-40. Doyle, M.A., Bosker, T., Martyniuk, C.J., MacLatchy, D.L. and Munkittrick, K.R. 2013. “The effects of 17α-ethinylestradiol (EE2) on molecular signalling cascades in mummichog (Fundulus heteroclitus)”. Aquat. Toxicol. 134-5:203-15. Gillio Meina, E., Lister, A., Bosker, T., Servos, M., Munkittrick, K. and MacLatchy, D. 2013. “Effects of 17α-ethinylestradiol (EE2) on endocrine status in mummichog (Fundulus heteroclitus) under differing salinity and temperature conditions”. Aquat. Toxicol. 134-5:92-103. Chandra, K., Bosker, T., Hogan, N., Lister, A., MacLatchy, D. and Currie, S. 2012. “Sustained high temperature increases the vitellogenin response to 17α-ethynylestradiol in mummichog (Fundulus heteroclitus)”. Aquat. Toxicol. 118/9:130-140. Lister, A., Van Der Kraak, G., Rutherford, R. and MacLatchy, D. 2011. “Fundulus heteroclitus: ovarian reproductive physiology and the impact of environmental contaminants”. Comp. Biochem. Physiol. C. 154:278-287. Bosker T., Hewitt, L.M., Munkittrick, K.R. and MacLatchy, D.L. 2010. “Using a refined short-term adult fish reproductive test for mummichog (Fundulus heteroclitus) to test complex effluents”. Environ. Ecotox. Saf. 73:1596-1601. MacLatchy, D.L., Milestone, C., Shaughnessy, K.S., Belknap, A.M., Dubé, M.G. and Hewitt, L.M. 2010. “Reproductive steroid responses in fish exposed to pulp mill condensates: An investigation of cause case study”. Water Qual. Res. J. Can. 45:163-173. Office hours: To schedule a meeting, please contact Melissa Heaman at mheaman@wlu.ca or 519.884.0710 x2443.